So, I did not get far on Life last night, I only managed to get the clown pieces flipped over and the edge assembled. I didn't feel that great and I was tired from the Krypt marathon the night before. The new boards are great however! It feels great to snap the pieces down and hear that click! They also offer just a bit more grip so the pieces stay in place (but can still slide if you want them to). I HIGHLY recommend these versus foam board or cardboard! This is my second attempt at assembling Life, (I started it 4 years ago and managed to not get far, I was busy with my new born son at the time); this being said, I am WAY better at puzzling now then I was then and Life is so easy compared to the puzzles we have been working on! Remember Dory from finding nemo and her line, "Just keep swimming". We joke all the time when you cant find a piece, "Just keep puzzling". Move on, dont get hung up hunting for one piece! It's such a waste of time most of the time! You will find it eventually. They key to these big boys is parallel processing! If you can get multiple sections going at a time, you will find more pieces as you are searching. 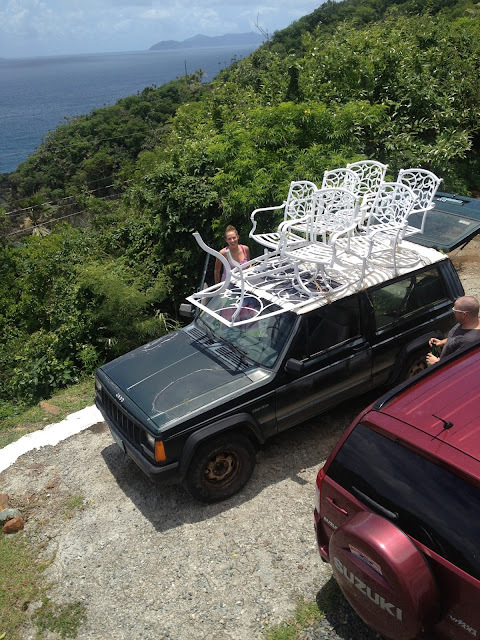 Oh we also picked up a new patio set today, check out how we got it home! Not a lot of progres last night, but the new boards are awesome! I highly recommend them! Hi guys! Sorry you didn't get too far on Life last night. I kept looking all day to see if there was a new update on it. And now, finally the first pictures on your blog of the Life puzzle! Woo hoo!!! So, you flipped all the clownfish pieces face up...are you planning to sort them by color / shape to make it easier, or just have a big pile of pieces to look through for what you need? The boards are cool. Longer than I was expecting though. You said you got just plain 1/8th inch plywood? I'm assuming it's not rough to the feel, right? I just updated my blog with a new picture of what I got done last night. Not a HUGE amount, but good enough for a couple of hours worth of work. I am hoping to get in some more time tomorrow. It's so funny you say that you struggled with the Life puzzle the first time you tried it. You guys have become such huge puzzle enthusiasts and masters at it that I'm sure this will be pretty easy for you now. I know I have gotten a little better since I first started Life, but I have a long ways to go and MANY more puzzles to do before I could possibly become as quick as you guys. It takes me a while, but I don't mind. It's just so much fun to do. I know I will get faster and faster with time and lots of practice. Sometimes I get frustrated because I see you guys and other puzzling friends that can knock out 50 or more pieces an hour...that's just not me,yet. I just have to remember this is really only the 3rd puzzle I've worked on in many, many years (since I was a kid really). The others were really small. I would love to become a puzzle master and be able to put a 1,500 piece puzzle together in one to two days even. That would be awesome....ahhh, a goal to reach! LOL....hope you and M are puzzling away tonight and having fun. Can't wait to see more pictures. It's going to be like re-living the Section 1 build as I watch how it comes together for you guys.